The covering letter that came with Data Design Systems’ ASTROCADE collection — six games selling for £4.50 — made vague references to a Mars Bar contained in the packaging, by way of a gentle incentive to whoever reviewed it. Presumably Roger (Gannet) Kean got to the post that morning, for there was no Choccy Comestible (LMLWD) contained therein. Stewart Green is the man behind Data Design Systems — which is run in best cottage industry style from the front room of a house which is crammed with boxes of duplicated tapes, jiffy bags, computer magazines and the all important Spectrum workstation. Mr Green was one of the first people to scamper out and buy a Spectrum when it was launched, and he spent many a long evening getting to grips with programming the beast. Stewart was on an engineering apprenticeship at the time, and gradually, as his hobby took up more and more time and he was going to bed later and later, he began to think about making a career out of programming. Having written a couple of games — Alien and Bomber — he decided to have a go at selling them. “I was a bit innocent at first, thinking that the games would sell themselves at £2.00. I took them round shows and sold a few in the simple packaging I thought was all I needed,” he explains, “I had to re-think my approach quite early on. 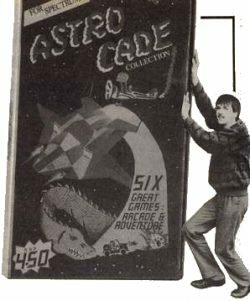 I decided that single games selling for £2.00 wouldn’t do as well as a package, so I reckoned that putting more games on one tape would be a better idea and allow me to charge more, thus allowing shops to take a better margin.” So the idea for the Astrocade compilation was born. Deciding that it was time to take the plunge, Stewart took up a place on the government’s Enterprise Allowance Scheme, set up to encourage entrepreneurial types who want to go into business for themselves. The basic deal is, providing you have at least £1,000 to invest in a project, the government will pay you £40 a week to live on for a year while the enterprise gets started. “It’s a good job I’m living at home and don’t drink or smoke,” Stewart admits a little ruefully, “it would have been very hard going otherwise. I decided I wanted to break into the budget software market — I think the software industry could be killing itself with the £10 game. Budget software like Cascade’s 50 Games compilation, has got to be value for money — if you only play each game on a 50 game compilation for ten minutes, then you’ve had over a day’s solid entertainment. “I decided to go for six games on one tape and set about writing them for the ASTROCADE collection. While I was programming I was also sorting out the packaging side and so on. All the time I was learning, finding things out for myself. The Enterprise Allowance people don’t actually give advice about setting up a business, but you get three free interviews at the Business Advice Centre where they can help with routine matters like accounts, VAT and so on. “Having decided that I wanted a large package for the compilation, I thought the cardboard boxes used by Beyond would be great — the problem I found with them is that you need to invest at least £800 in the dies to cut the cardboard and then there’s the printing costs on top of that. Video boxes seemed the answer — and it took ages to find out who supplied them. “The next step was to organise some inlay artwork and screenshots — have you ever tried looking in the Yellow Pages for an artist? It doesn’t work. There are plenty of expensive advertising and design agencies around who want hundreds of pounds for a simple piece of artwork. In the end I had a chat with a lecturer at the local tech and found an art student who did the work for his portfolio as a bit of experience really. Then it took two weeks to sort out the screenshots, because our local photographer hadn’t a clue about taking snaps off a telly. “All I seemed to be doing was trudging round printers and the shops trying to get things organised, but eventually the programs were written and everything was ready. The product is fine — it’s distribution that’s the problem now, which is not what I expected. I sent copies off to distributors and chain stores for evaluation and most of them didn’t bother to reply. Smiths want barcoded products, and that’ll cost another £100 — the problems seem endless. Most people want to see large advertising budgets before they’ll stock a game it seems. Sales so far number about a hundred units — all achieved by Stewart himself trudging round local computer shops and offering a couple of packages on sale or return. Which is how Imagine started, all those years ago... Is he disillusioned having spent £3,000 and still a fair way away from breaking even? There’s more in the pipeline from DDS than Astrocade, though. Stewart’s got several ideas underway at the moment, including a Play by Mail computer game in which up to a hundred people with different computers could compete with each other in a single galaxy. “Small companies seem to offer the best service in the Play by Mail field,” he explains, “and there’s still a chance to get in. I’m developing a graphics handling routine for a Play by Mail game at the moment. “I’m probably one of the last of the small software houses and may have to go freelance to survive soon — you need a lot of money behind you to stay independent. People compare the software industry with the music business, but it’s much more like making films — you have to come up with the plot, the music, everything. So do we. A full review of Stewart’s six game compilation will appear in the next issue.